A recombinant series of digital paintings by artist Michael Manning will be on the front page of rhizome.org all week as the final work in the ongoing online exhibition "Brushes," presented by Rhizome and the New Museum for the First Look series. 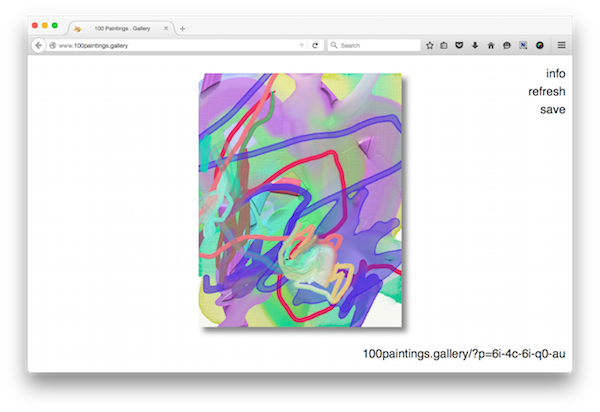 The works are from 100paintings.gallery, a new online work by Manning with code by Zach Shipko. The site randomly combines a selection of 100 different paintings in five layers to create a unique composition each time the page is refreshed. According to the artist statement, "this set of parameters allows for over 9 billion unique works." Each 800x1000px composition can be downloaded as well as shared via a generated permalink. Read Michael Manning's Artist Profile here. Read about his Microsoft Store Paintings on Rhizome and on artist Tom Moody's blog.